I understand Babe is slightly improved but still not out of the woods, poor guy. I sure sympathize with him. Re writing a book on your experiences with Ted, I think you are very sensible to place it in the hands of a name writer, not so much for the writing of it, but for his connections with the best publishing firms which is very important. As far as the writing is concerned, you are very capable in that line yourself & I doubt if there would be much for them to do on it, other than touching it up here & there & adding their name as a seal for selling purposes. I think it will be necessary Betty to make a good outline of your story before you do anything about contacting anybody, it would be difficult to explain unless they saw it in writing. In the meantime I'll check around & get some information on literary agents who handle writers, stories etc. You mention that the studios have tried to get this story, I really think you should consider it, apart from getting roya1ties on the picture, you could make a nice sum for yourself by personally supervising the making of it & picking the caste etc. & it would be told exactly as you would want it. Naturally, the Stooges would have to be in it as they were one of Ted's creations & would be interesting to an audience, to know how they actually came into being. Am feeling a bit better again, the sneezing Bus. has stopped, but I still get the headaches once in a while. Anyway, it seems, the Dr. thinks the smog may have something to do with it - could be. Thanks for the brochure on Apple Valley Inn, maybe one of [these] days I'll take a trip up there, it looks very nice. Think thats all for now, I understand Babe is slightly improved but still not out of the woods, poor guy, I sure sympathize with him. Eda joins in all the best to Wayne & self, hope you do'nt think I'm drunk, the typewriter has gone on the bum, got to get it overhauled or a new one (had it about 26 years). Bye now. Good luck & God Bless. Stan had a little trouble with his typewriter near the end of this letter, with the carriage jumping up and down causing the letters to appear crooked on the page—hence his joke about being drunk. Betty first husband, Ted Healy (1896-1937) was an American vaudeville performer and actor. He is chiefly remembered today for his association with the Three Stooges, but had a successful career of his own. He married Betty in 1922 and died at 41 under suspicious circumstances. Many thanks yours 1st.inst. so nice to hear from you again - appreciated your kind thought & wishes re babe (Hardy). You can imagine how shocked I was to hear the news about him on TV & of course still very upset about it. However, I understand he has slightly improved & prospects for recovery are very encouraging. Poor Babe, I really feel sorry for him, having gone through this myself I can fully sympathize. Unfortunately his stroke was more serious than mine, apart from being paralyzed on his right side it affected his speech too & is unable to talk, but they say this will be temporary. Anyway, everything possible is being done to help him get well again, but its a slow procedure & will take time. Pleased to say, I am coming along fine & able to get around quite a bit, thank God. Jimmy Murphy dropped in to see me a few months ago, still the same character, he's working for the Head of "Pepsicola" Co. who's married to Joan Crawford, Jimmy travels around with them, kind of a valet etc. I think Joan Crawford is in England now making a film. Do you ever see or hear from Jackie Alderson? (the other Lad from Newton-Le-Willows) what a team - Murphy & Alderson! Think thats all for now Jock. Mrs L. joins in kind regards & every good wish to your sweet Mother & self & again thanks for your kind remembrance. Maybe you are right giving up the idea of going into the real estate bus. right now, it is a lot or hard work & study to get a license & probably be a strain on you, especially being in the condition you are, you have to have a lot or energy to tackle that kind or work, I mean if you were in Bus. for yourself. I think tho' you could manage being with the Strout Co. handling occasional deals, that would'nt be too hard on you. Note your attorney is going to start suit, did he tell you what the offer was? I was hoping you would'nt have to go into court as those things can go on & on, if you win the case, they start appealing, thats part of their racket, to settle on their terms. Anyway, they, may try to settle again if they see you mean business. Re the Healy story, there is a good writer for this class of material who may be interested, his name is Cameron Shipp, you could contact him C/O Doubleday & Co. in Garden City. New York. he wrote the Mack Sennett book, Ethel Merman etc. etc. You could drop him a line & find out if he would be interested in reading your rough draft, if he is, he would probably fly out here to get the data from you personally, in the meantime you could still be working on it, I think this would save a lot or time. I'll check around for other name writers in case this does'nt work out, its possible he might have a lot of work on hand & may suggest someone to you. Am still having slight headaches, can't seem to find out the cause, have an appointment with another Dr in the morning for a check up. Babe is back home again, still in bed of course & has two male nurses, its hard to tell how he feels as he's not yet able to talk, poor Babe, I feel terrible about it all, its really sad. All for now Betty, let me know if you hear from Cameron Shipp, hope you connect with him as Doubleday Co is one of [the] biggest publishing firms & your book would'nt have to be peddled around, his name on it would sell it. No, I don't mind you calling me Stan. If the President doesn’t object to being called Ike—why should I? No, I didn't know of your Towne Music till I got your letter. I played in vaudeville years ago in Scranton at the POLO THEATRE there - don't know if it's in existence anymore. Mr Hardy has left the hospital now - his address is - 5429,WOODMAN AVE.VAN NUYS.CALIF. No, I don't mind you calling me Stan. If the President doesn't object to being called IKE - why should I? I have just recd. 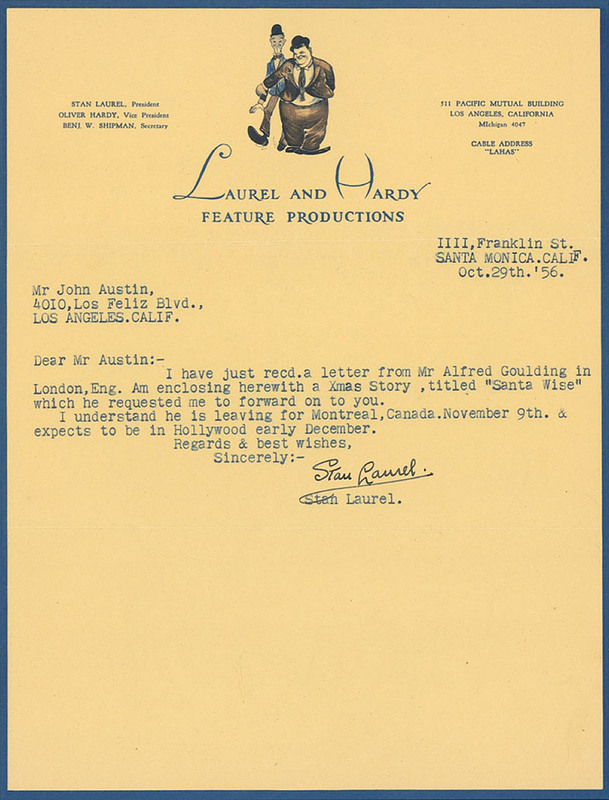 a letter from Mr Alfred Goulding in London, Eng. Am enclosing herewith a Xmas Story, titled "Santa Wise" which he requested me to forward on to you. I understand he is leaving for Montreal, Canada. November 9th. & expects to be in Hollywood early December. Thanks your letter [Jimmy Wiseman] regarding the film "Pardon Us." You are rught, that is the prison picture, where I got the machine gun & started an escape from the mess hall. Pleased to know the club members are enjoiying the films. Kindly convey our regards & best to all.